In continuing to explore the marvels of the solar system, Bova (Venus) tracks the metamorphosis of his protagonist, Grant Archer, from a selfish, petulant grad student into a man who does what's right despite massive pressures. Sent to study on Jupiter's orbital space station, rather than the more desirable lunar colony, astrophysicist Archer resents everyone and complains about his bad luck; he isn't even allowed to study in his field of expertise. The New Morality, the ultrareligious creationist group who controls the U.S., has given him the additional task of spying on the station's untrustworthy scientists who are suspected of looking for Jovian life. The mere existence of extraterrestrials would conflict with New Morality doctrine. Grant is a true believer, but he's also a scientist resentful of the New Morality's control over his life. When he's given a chance to aid in the Jovian research, he jumps at it, even though it means horrifying modifications to his body and repeated drownings. This easy read provides solid action and wonder with credible alien life forms and inspired technology for exploring the Jovian depths. 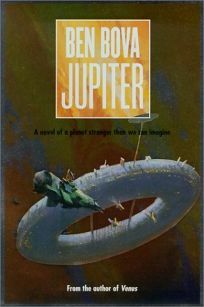 Jupiter is a new favorite destination for sci-fi exploration, and Bova's take on the planet is unique and enticing. (Jan. 1) Forecast: Bova is one of the more popular SF writers--he's won six Hugos--and fans of Venus will delight in the continuation of the series, which gets a push in the Nov. issue of Locus, with Bova as the cover interview. Heavenly sales could ensue.